Starting 2019 with an exciting new project reveal…a bright, fresh and modern basement playroom and family living space!!! Can you even believe this is a basement? This room truly has EVERYTHING a family with kids could dream of; a place for the kids to play, storage for toys and a casual TV space where family and friends can relax together. My clients have three little kids; a one year old, three year old and five year old, so wanted the space to have lots of storage for the kids’ toys and also a fun factor (have you seen the slide?)! 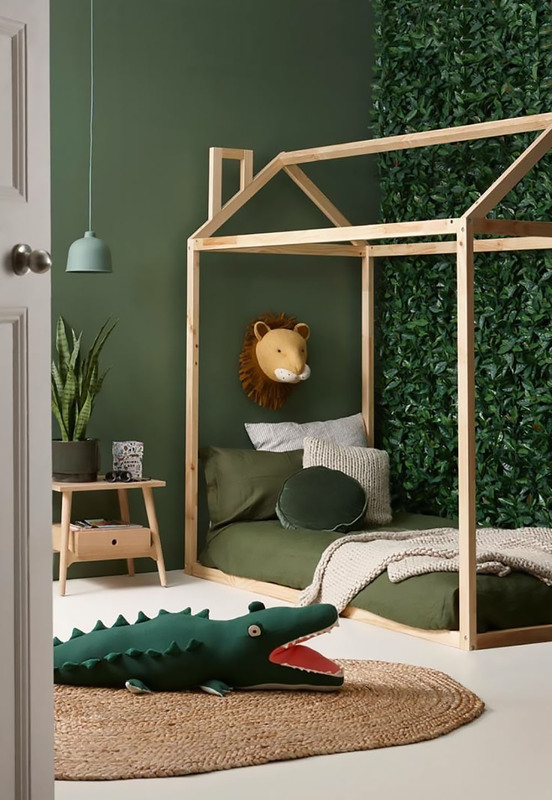 The wall decals from Urban Walls (Riptide Watercolour in Indigo at half intensity) create SO much fun impact for a room that will transition as the children grow. The decals are perfect for now and can so easily be peeled off and changed when the time comes. They are also amazingly easy to put up! We looked for extra large scale letters on the market but after searching and falling short, decided to have these PLAY letters custom made for the wall. Since this part of the ceiling is low, the letters give the big impact we were going for. If you’ve followed along for a while, you will know that I LOVE storage baskets (such as in Rafa + Leo’s room), especially pretty ones with lids, and the capacity of these ones is incredible. You can honestly fit large plastic toys in there! Good storage is key for a playroom and I like using easy-to-pull-out baskets for everyday play toys like blocks, Magnatiles, even puzzles. These storage cubes are at just the right height for toddlers to be able to pull out and put back the baskets themselves, which is always a win! I love that everything in this space is fully accessible for the sweet little kiddos who call this play space home. 01.// Cubebot; 02.// Pillow; 03.// Basket; 04.// Bowl; 05.// Play table; 06.// Bin; 07.// Stool; 08.// Slide; 09.// Play mat; 10.// Storage baskets. FRIDAY INSPIRATION: HOUSE FRAME BEDS! It's Friday and for my next project, my client has asked for a house bed for her son's room!!! With that request, I thought it would be the perfect time to share some of my inspiration for this fun bed idea. I love the simple lines of the house bed and how such a simple concept adds so much impact. This bed draped with a sheer curtain provides a cozy canopy for any little one. Having a bed directly on the floor is the most common style but a house frame bed can also have legs so that there is air flow beneath the mattress too. I love this bed below for that! There are so many variations and the little chimney is a cute addition, as seen here. Today we’re talking dressers; the one piece of storage that you buy once and keep from baby room to first apartment and beyond. Important, right?! While other pieces of furniture come and go, the right dresser will literally last a lifetime! Consider the following tips to help assess which dresser best fits the need for your child’s room. How much space do you have to work with? Too small of a dresser can leave a room looking empty and sparse, and too large can make the room feel cluttered and small. A pro tip is to use painter’s tape and measure the dresser base size on the floor, and height against the wall to visualize how the piece will fit into the room. A good rule of thumb is to leave at least 40 cms on either side of the dresser to allow for a diaper pail or storage basket. The height of the dresser you choose can make a big difference if you’re starting off by using it as a change table. Choose one that is comfortable to stand up beside so you won’t need to bend down too far for diaper changes. Think about what purpose the dresser will serve and how much storage you will need. In the early years, a dresser can begin as a change table by adding a simple change table topper. The top drawer can hold lotions, wipes, diapers and washcloths. The middle drawer(s) can hold clothing, and the bottom is the perfect place for extra crib linens, swaddle blankets and even soft baby carriers. Instead of going out to buy a whole new dresser when your baby no longer needs diapers, simply remove the change table topper and reorganize the top drawer with socks, under layers and pjs, and the bottom drawer as toy storage. It’s a nice spot to keep favourite play items that can be easily accessed by independent little hands. Solid Wood: It has the highest durability and will last many years. This comes usually at a higher price point. A dresser made of solid wood will be heaviest one to transport. Solid wood requires the least amount of chemical components for construction. MDF (medium density fibreboard): Is less durable than solid wood, and usually in the mid-range price point. It’s lighter and easier to transport. MDF is created by compressing wood fibers with resin at high temperatures, which include more chemical components than solid wood. Particle Board: Is similar durability to MDF, and is the lower price point option. It is lighter and easier to transport. Particle board is created by compressing sawdust and resin at high temperatures and includes more chemical components compared to solid wood. Next, ask yourself - does the aesthetic of the dresser match the rest of your room? Will it visually fit in with other furniture pieces you already have? Often new parents purchase crib and change table sets together, so another important economical consideration is if the dresser can stand alone as a piece within a room. As your child matures and you remove a crib or purchase the next size bed, will the dresser still look appropriate for their age and room aesthetic? The tall dresser will offer one row of 4+ drawers high. It’s good to look for a tall dresser if your room space is limited or if you don’t have a closet and need to maximize storage. Depending on the height of the dresser you may be limited in wall space for art, or hanging a mirror above this style. The double wide dresser has a wider base with two rows of 3-4 drawers. This is a great way to maximize storage if you have a lot of square footage in the room and want a larger furniture piece to help fill space. As the double wide isn’t typically very tall it works well to hang art or a mirror above it when decorating. The classic 3 drawer is a great option for a room with a closet or minimal storage requirements. It’s best suited for small to mid sized rooms as it can look smaller in large rooms with less furniture. It can also serve as a bedside table depending on the dimensions of the one you choose and works as a great piece to position under artwork or a beautiful mirror. If you think about it, it’s pretty incredible that one piece can hold everything from diapers and wipes, to clothing, linens, toys, and secret journals. One of the most important things to be sure of when choosing your dresser, or any large piece of furniture for that matter, is that it is well made. Choose a dresser that is able hold piles of clothing and can withstand the wear and tear of childhood years, and many repeated pressures of clean laundry refills. Pull the drawers out and look at the sturdiness of the drawer base, and check if the hardware is well attached. If you’re shopping online make sure to read reviews from other parents to see if the piece is really as great as the description may suggest. A dresser is a “home base”. It’s a place you will come to, time and time again as a parent to change a diaper, tuck away a toy, and fill up with fresh clean laundry. It will display a family photo, a favourite stuffed animal, or a treasure box of keepsakes your child has collected. A dresser is the one piece, which if chosen with thought and intention, will offer years of helpful storage and organization and bring aesthetic joy to your home. 01. // Mid-century white; 02. // Eclectic white; 03. // Modern white; 04. // Streamlined white; 05. // Campaign white; 06. // Basic white; 07. // Trad white; 08. // Dwell white; 09. // Timeless white; 10. // Radiant Dresser; 11. // White trim; 12. // Classic natural; 13. // Lovely natural; 14. // Modern natural; 15. // Oak dresser; 16. // Trad natural; 17. // Sleek natural; 18. // Kalon dresser; 19. //Sleek black; 20. // Eclectic black; 21. // Basic black; 22. // Modern black; 23. // Mid-century black; 24. // Tall black; 25. // Happy black; 26. // Block black; 27. // Darkest black.